School Days With A Pig is a film that begins initially with a delightfully cute premise yet veers into the territory of issues such as morality and death. 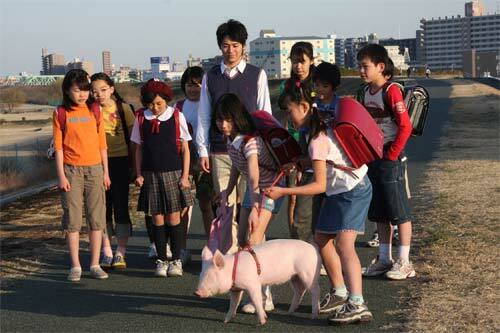 Teacher Mr. Hoshi, played by Satoshi Tsumabuki, introduces to his class of sixth graders a young pig, and then asks them if they would be interested in raising the pig for their school term and then eating it afterwards. The children emphatically agree, living only in the present and considering little about the potential end result. The director, Tetsu Maeda, weaves the audience through the lives of the children, who take care of the pig from when it is still a piglet to when it is larger than they are. Slight scuffles with faculty and parents emerge, but the tone of the movie is light-hearted for the most part, showing the children’s day-to-day hardships and joys in taking care of a pig. While movies about food and humanity’s impact on the food system are being made at an increasing rate, School Days With A Pig never comes even remotely close to preachy. In fact, the film actually strays so far away from preachy that despite Mr. Hoshi’s attempt to craft a project that will make his children think critically about the food they eat, his reasoning is never truly clear, and stops short of a vague desire to “want the kids to learn.” One gets the sense that Mr. Hoshi never truly anticipated the potential results himself, and he firmly sits on middle ground in an area of indecision, at least with regards to the fate of the pig. The film remains strong while staying in positive territory, but sadly, the weakest part of the film actually lies in its most serious and crucial part: the class discussion on what to do with the pig after their school term has ended. Despite agreeing initially to eating the pig after the project, the students become attached, and disagree on the fate of the pig. They begin to discuss critically “adult” issues of life, death, adoption, faith, and friendship. This particular part of the film gives viewers a chance look into the thoughts that children — and maybe even adults — might have in such an emotional scenario, where logic sometimes takes a back seat. And although this part is absolutely vital to the film, it becomes long-winded and poorly argued, and simply makes the film seem much longer than it needs to be. School Days With A Pig is rather successful in highlighting a hard-to-believe premise, but just a little editing could have made it a nearly perfect, considerate tale.